The Learning Resource Centre is a busy and vibrant place in which the girls are free to work, study or just relax quietly on a bean bag and enjoy reading. We regularly add to our extensive collection of fiction, researching and purchasing the best novels for young people on the market today. 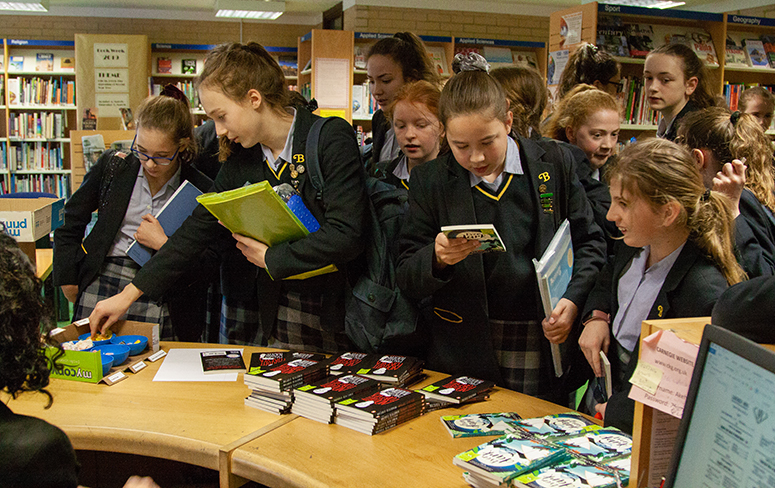 One of our main priorities is to encourage reading for pleasure which we do in a variety of ways, from maintaining a bespoke reading scheme for Year 7 through to Year 9, to following the Carnegie book shadowing and the Southern Schools Book Award reading project, to advertising and encouraging student participation in nationwide creative writing competitions. The ‘LRC’ as it is affectionately known, also has an eclectic range of DVDs which girls can borrow free of charge and a large selection of non-fiction resources to access both online and on the shelves. There are current magazines and newspapers, state-of-the-art computing facilities plus a library professional on-hand at all times to assist with anything from finding a good book to helping with homework to photocopying missed school work. The LRC welcomes students from 8.30am and remains open until 6pm every evening. This after-school provision enables girls to complete homework while they wait for parents and carers. With so much on offer it is no wonder the LRC is a thriving hub of activity throughout the school day.